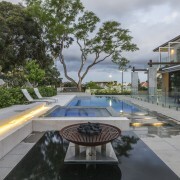 Perfect for entertaining on a grand scale, this 1970s house has been completely transformed with a major renovation by Rodrigues Bodycoat Architects that includes a new 16m x 4m north-facing terrace and a new swimming pool. When it's impossible to tell by looking whether a renovated house is a new build or a remodel, you know it's a project that's out of the ordinary. This house, built in the '70s, is such a property. 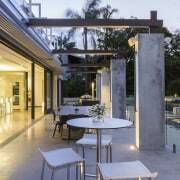 Architect Simon Rodrigues of Rodrigues Bodycoat Architects says the owners had been living in the home for 10 years and loved the huge size of the site and the high-end location. But they were not so enamoured of the interior, which was not well suited to modern living. "The house was very much a product of the '70s," Rodrigues says. 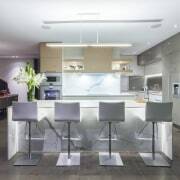 "There was an internalised kitchen, with a limited connection between the kitchen and living areas, and between inside and out. The passage linking the entry with the living spaces was very narrow, so there was no sense of welcome." However, the architect says the house had good bones and was well positioned on the gently sloping site, with a good orientation to the sun. "While we did discuss a completely new build, the owners preferred a more sustainable, adaptive reuse option. They were keen to preserve as much of the existing dwelling as possible. 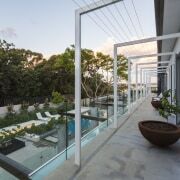 Although they wanted a modern design, it couldn't be too contemporary or austere they appreciated the traditional qualities of the neighbourhood and wanted their home to be warm and comfortable. In this major renovation of a 1970s house, several walls were removed on the interior to create one large open-plan living space. This passage leads to service rooms. The design is by Rodrigues Bodycoat Architects. 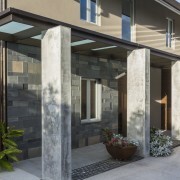 "The project became a renovation and addition. Remnants of the original form and some of the fenestration remain as reminders of the original building. However, the result is indistinguishable from a new build." To create a strong sense of arrival, the architect introduced a glazed canopy to the entry, and a timber-clad door within a steel plate frame. This now opens to a wide, light and airy hallway. "Space was claimed from the former dining room we cut through a wall to provide a direct link from the entry to the living areas on the north side of the house. This means guests no longer have to walk down a long narrow passage at the back of the living areas. Instead they are drawn forward towards the sunlight and the garden and pool beyond." To gain extra space for the living areas and bedrooms on the upper level, the north side of the house was extended by several metres. The house was also pushed out towards the east. 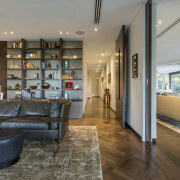 On the ground floor, several walls were removed to create one extra-large, open-plan living space. Part of the original exterior wall remains providing structural support, and defining the dining area. 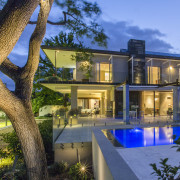 Large timber-framed sliding glass doors open up to a huge 16m-long terrace overlooking a new swimming pool in one direction and a tennis court in the other. The doors can be stacked in a range of configurations. 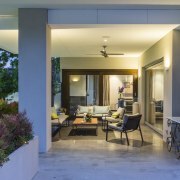 On the terrace a retractable awning provides shade for the living area in summer, yet allows the sun to warm the interior in winter. There are also huge overhangs on the east side to keep the sun at bay in the heat of the summer. 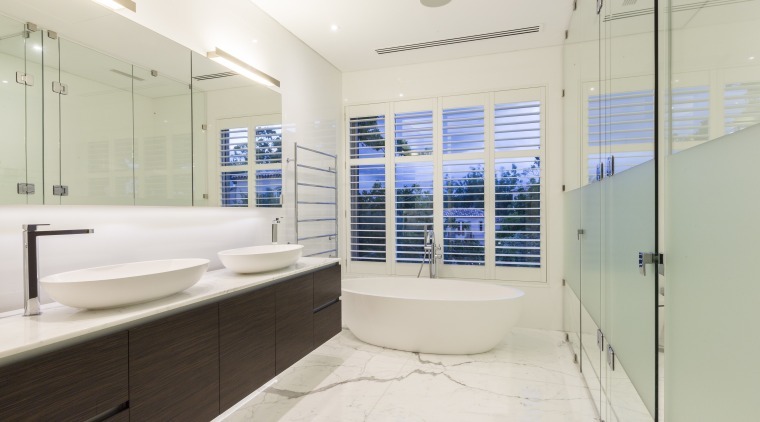 The master suite in this remodelled 1970s house features a contemporary bathroom that also retains a hint of the traditional, with painted shutters, a marble floor and a freestanding tub. The shower room and a separate toilet room are behind the frosted glass doors. The design is by Rodrigues Bodycoat Architects. 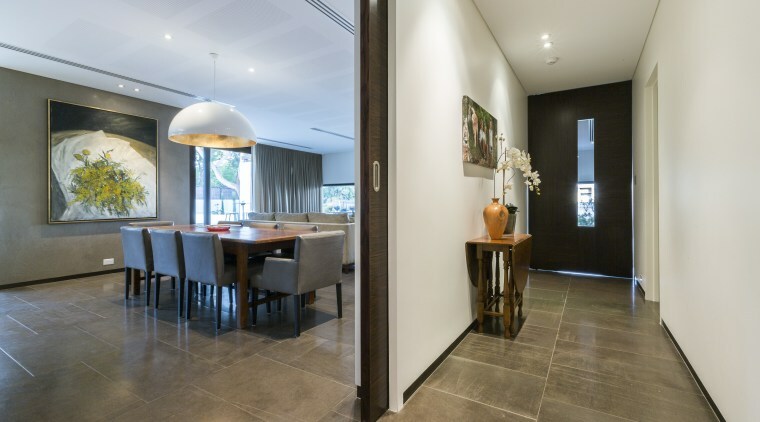 "We specified timber joinery to bring a little visual warmth to the interior," says Rodrigues. "For the same reason we added French doors to the bedrooms that open to the upper terrace. These are another traditional reference, as are the pergola elements." The original staircase was retained, with a new walnut balustrade to match the flooring. A mix of materials features in the kitchen. 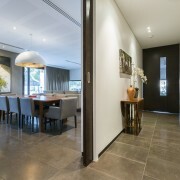 The cabinetry is lacquered, while the oven tower and panelling around the extractor are a light timber veneer. Marble, with a prominent veining, was specified for the front of the island and splashback. Additional storage and bench space are provided in a hidden scullery at the rear. The house has air conditioning, but this is rarely used as there is good cross ventilation on both floors. "We also incorporated a large array of solar panels on the north-facing roof. These generate sufficient electricity to meet the energy needs of the household," says Rodrigues. "Rainwater is also harvested for reuse in the vegetable and herb gardens."